You are here: Home / Delete Social Media / How to Delete Facebook Page Permanently? 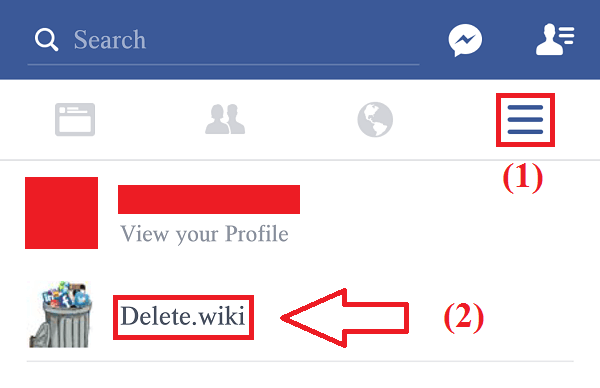 How to Delete Facebook Page Permanently? There might have been different reasons why you have created a Facebook page. You might have been so obsessed with someone/something that you created a Facebook Fan page, and now you have lost interest in them. You might have created a Facebook page to promote any business, and now you have to cease to continue that business or you find Facebook not appropriate to market your product. Whatsoever be the reason, you can always delete a Facebook page just by following the simple steps listed below. But remember you need to be an admin of that page to delete the Facebook page. 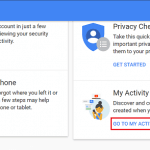 If your intention is not only to delete Facebook Fan page but also to get rid of Facebook account entirely; then you can get the updated procedure to delete the Facebook account in the article?close Facebook account permanently. Open Facebook application:?First of all open the Facebook app on your smartphone/ tablet. To open Facebook, open the list of application, find and tap on the Facebook icon. Login:?Since it is your smartphone, it is apparent that you are already logged in to Facebook. 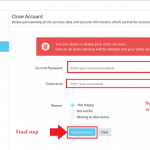 If you are not logged in then log in with the username and password of the account with which the page you want to delete is associated. Open Facebook Fan Page: Once you log in, tap on the menu icon towards the top of the page. Menu icon is the three horizontal lines that lie to the right of the notification icon. As you tap on the menu icon, a drop-down list will appear. 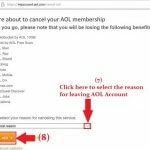 ?In the drop-down list, you will see the list of the pages associated with your account. From among the page select the page that you want to delete. Settings: Just to the right, of search navigation panel tap on the menu option and a list of option will pop up. From among the menu tap on Edit Settings. Go to General: In the Edit Settings page tap on General option at the top. Delete Facebook page: In the edit page swipe to the bottom of the page. Tap on Delete this page option. Confirm your choice, and the Facebook page will move to the deletion process. Open Facebook: Browse facebook.com in any internet browser you prefer. Log into Facebook: Log in with the username and password of the account with which the Facebook page you want to delete is associated. Open Facebook page: After logging in to Facebook, click on small reverse triangle just to the right of privacy shortcut icon. You will see all the Facebook pages associated with your Facebook account in?the drop-down list. Now click on the Facebook page you want to delete. Settings: Click on settings at the top of the page, just to the left of Help menu. Delete Facebook page: In the settings pages, under the General tab, at the bottom of the page, you will see Remove page option. Click on Delete your page. 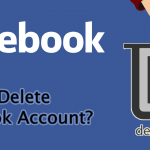 Confirm the choice, and your Facebook page will move to the process of permanent deletion. 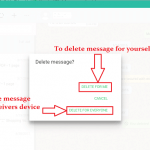 Once you move your page to deletion process either by using a web portal or by using Facebook Application, it won’t be accessible to any person. However, in any case, you want to restore the Facebook page you can do so within 14 days. 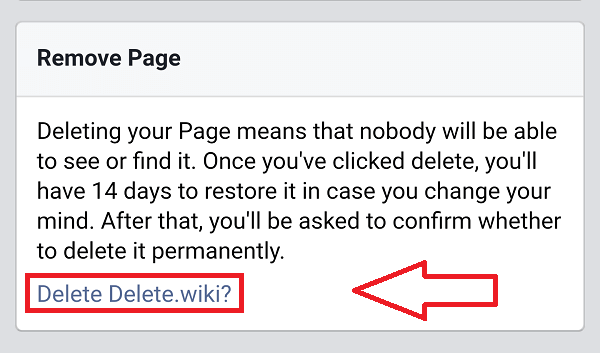 After 14 days Facebook will ask you again if you wish to remove the Facebook page or not. Just click on yes then your Facebook page will finally be deleted permanently.